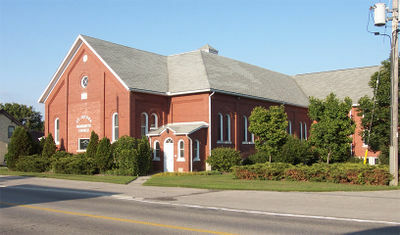 The St. Jacobs Mennonite Church (SJMC) is located in the village of St. Jacobs, Ontario, a significant tourist area, bordering the city of Waterloo. However, its story begins over 150 years earlier, two miles northwest of the village where much of the land was being cleared for the first time by pioneering families. On 29 October 1844, just over 1 ¼ acres of land was bought from one John Brubacher for five shillings by John S. Brubacher, John W. Brubacher and Peter Eby on behalf of those in the area wishing to form a Mennonite congregation. The land bought was to be used for a church, school and cemetery. A log school house was built immediately which doubled as a meeting house until a frame meeting house was built in the early 1850s. Ludwig Koch was ordained in 1845 and served as minister of this new Conestoga congregation as well as at Elmira and Martin’s. John W. Brubacher, one of the original trustees was ordained as a deacon in 1847. His daughter Esther was the first burial in 1856. The congregation met in what was known as the Conestoga Mennonite Meetinghouse. In 1889 there was a split in the Ontario Mennonite Conference between what became known as the “conference group” and the more conservative “Old Order” group. At the Conestoga congregation, the Old Orders outnumbered the conference group and thus continued to meet in the frame building while the other group met in homes. However, in the years that followed, many families who had joined the Old Order movement returned to the conference group, creating pressure on the Old Order group to return the building. In 1892, the Old Order group built a new meetinghouse one half mile to the south which itself became known as the Conestoga Mennonite Meetinghouse as it is today. In 1915 the original Conestoga congregation (conference group) built a new red brick building in the village of St. Jacobs on land donated by Samuel Good with subsequent building projects in 1936, 1949, 1977 and 1990. The original meetinghouse was torn down but the site remains the SJMC cemetery. In the 1910s the language of worship changed from German to English. In 1935 a Community Summer Bible School was held. This has continued to the present, now known as Vacation Bible School and is a joint effort of the village’s three churches, Mennonite, Evangelical Lutheran and United. Over the years (particularly in the late 19th and early 20th century) the congregation at St. Jacobs experienced a significant influx of people who wanted to leave the somewhat restrictive lifestyle of the Old Order community yet maintain a Mennonite faith perspective. The St. Jacobs congregation, with its largely rural farming community “fit the bill” for many families. In 1979 the SJMC began sponsoring refugees from Laos. By the late1980s this group began meeting on their own for worship services at the St. Jacobs Church. They soon formed their own MCEC congregation (Grace Lao) and in 1999 bought their own church building on Lancaster Street in Kitchener. Through the late 1970s and 1980s there was a deliberate effort made to provide opportunities for young people within the congregation to explore and test their gifts and interest in pastoral ministry. This resulted in a number of young people who went on to study at church schools and then became pastors in various North American settings. In the late 1980s and 1990s a number of young adults left to study both music and theology at what was then known as the Canadian Mennonite Bible College, a predominately Russian Mennonite school in Winnipeg. This resulted in a many friendships made across the Mennonite cultural perspective - some even choosing to marry people of Russian Mennonite descent. In a way this should not be surprising as the three former conferences in Ontario were very interactive long before formal talks of church integration began. The village of St. Jacobs has become a very popular tourist destination. In order to give this growing tourist population a complete and accurate portrayal of who Mennonites are, the Meetingplace was formed in 1979. Today this building is known as the Visitor Centre and features a multimedia presentation of Mennonite history, culture and religious beliefs, while also serving as a tourist information center. In the past many SJMC members were part of farm families, attending church in a rural village. Today, very few are farmers and the rural village is on the doorstep of the City of Waterloo. Its rural roots have been replaced by a more suburban atmosphere. Music has always been a focus of worship, especially congregational singing which is sung unaccompanied and in four-part harmony. The congregation has always been a strong financial supporter of its conferences, particularly the local conference, now known as Mennonite Church Eastern Canada. Brubacher, David. "A History of the St. Jacobs Mennonite Church." Research paper, Canadian Mennonite Bible College, 1978, 32 pp. Mennonite Heritage Centre. Burkholder, L. J. A Brief History of the Mennonites in Ontario. Kitchener, ON: Mennonite Conference of Ontario, 1935: 90-92. Feick, Magdalena. <em">I Will Build My Church: Conestogo/St. Jacobs Mennonite Church, 1844-1986. St. Jacobs: St. Jacobs Mennonite Church, 1986, 47 pp. Martin, Almeda S. "Steps into History." Unpublished paper, 1977. Martin, Simeon E. "A History of the St. Jacobs-Conestoga Congregation." Unpublished paper, 1965. Martin, Virgil Emerson. The Early History of Jakobstettel. St. Jacobs, Ont. : V.E. Martin, c1979. Mennonite Reporter (20 March 1989): 11. Sauder, Ben. "History of the St. Jacobs Mennonite Church." Unpublished paper, 1960. By Roy S. Koch. Copied by permission of Herald Press, Harrisonburg, Virginia, from Mennonite Encyclopedia, Vol. 4, p. 402. All rights reserved. St. Jacobs (Ontario) Mennonite Church (Mennonite Church), a member of the Ontario Conference, built its first log meetinghouse two miles west of St. Jacobs in 1844-45, to serve also as a school; it was called the Conestoga Church. The congregation was divided by the Wisler split that affected a large part of Ontario in 1889. The Wisler (Old Order Mennonite) group used the meetinghouse until the fall of 1892. The present congregation started using the building on 1 January 1893. In 1915 a new church was built in St. Jacobs, its present location, and the congregation adopted the name St. Jacobs Mennonite Church. The meetinghouse was enlarged twice, in 1936 and in 1949. Roy S. Koch (ordained as minister in 1936 and as bishop in 1950) served the congregation until 1957. He was succeeded by Raymond Kramer. The membership in 1958 was 415. Bauman, Janet and Trevor Bauman. "St. Jacobs Mennonite Church (St. Jacobs, Ontario, Canada)." Global Anabaptist Mennonite Encyclopedia Online. September 2011. Web. 25 Apr 2019. http://gameo.org/index.php?title=St._Jacobs_Mennonite_Church_(St._Jacobs,_Ontario,_Canada)&oldid=143183. Bauman, Janet and Trevor Bauman. (September 2011). St. Jacobs Mennonite Church (St. Jacobs, Ontario, Canada). Global Anabaptist Mennonite Encyclopedia Online. Retrieved 25 April 2019, from http://gameo.org/index.php?title=St._Jacobs_Mennonite_Church_(St._Jacobs,_Ontario,_Canada)&oldid=143183. This page was last modified on 14 January 2017, at 12:00.